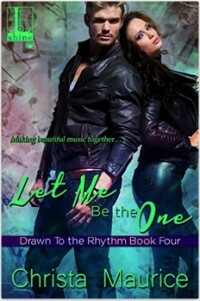 Let Me Be the One is here! Brian stared at a seam in the stage. After the show tonight, they went home. With the sixteen-hour time difference, they’d be landing about four hours before they took off. Add in time to recover from jet lag, and it was going to be at least two days before he could seriously start searching for her. The kids. He got the kids when he went home, too. Bonnie would dump them with him at the airport if she could. Of course, the kids liked Suzi, so they’d be all for helping him search. “He said some groupie stuck his fingers in her mouth and that’s when Suzi walked up and saw it and it was just bad timing and there was nothing to it and he’s sorry and do I know where she is because he’s sure she’ll contact one of us because she doesn’t have any ID or her phone or anything on her,” Bear said. Bear and Jason both stared at him as if he’d slipped a gear. “How many times has Logan been caught in a tight spot like that?” Brian demanded. “Yes Brian, who told you that?” Jason narrowed his eyes at Brian. “I got an email from Duke.” Of the thirty or so he’d sent out. Some of the people he’d tried hadn’t been at the party. Hell, SendDown was touring Europe. They hadn’t even heard and asked him for information. “He just said Suzi wasn’t feeling good and went hunting for Logan and found him with Gillian. I’m a little disappointed in his taste. Gillian’s a skanky whore, and he had Suzi at home.” Had being the operative word. “True, but Bear would know more about that than I would.” Jason smirked at Bear. “Are we done here?” Brian scowled. Standing around yammering wasn’t the best use of his time. He needed to get back online and check his email. There might have been new developments, or Suzi might have returned one of the half dozen emails he’d sent since the day before yesterday. “Yeah, but she ran with Brett Cherney. If you want to talk about questionable taste.” Bear made a wobbly hand gesture. Brian walked away. If they weren’t done with sound check, they could come find him. He had better things to do than stand around rehashing Suzi and Logan’s break-up. None of his friends were thinking about Suzi with Brett Cherney, who was twenty-four, at the beginning of what appeared to be a long-running career, and carried a reputation for being wild. Brian didn’t want to think about that.